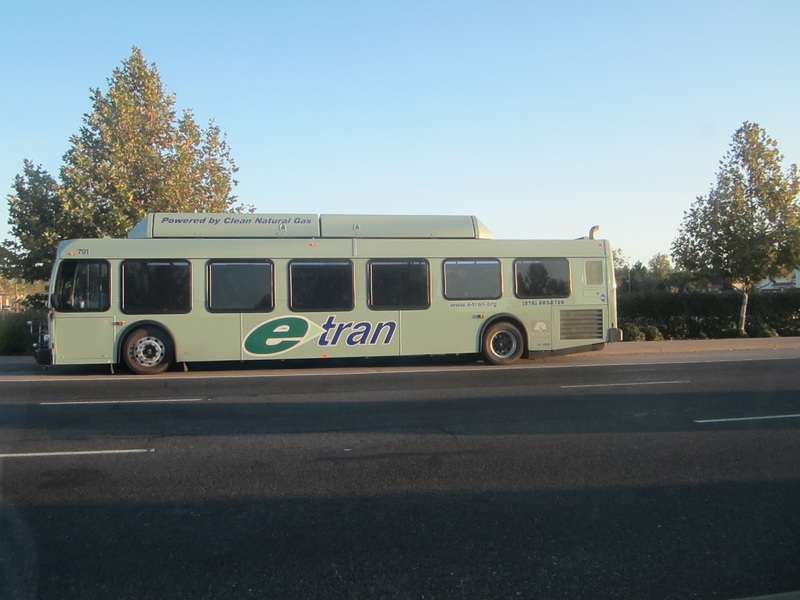 At Wednesday night's Elk Grove City Council meeting, possible major changes to the city's etran bus commuter routes will be discussed. The proposed route changes would affect the city's numerous commuter routes to downtown Sacramento. The route changes are being explored with the anticipated September, 2015 opening of Sacramento Regional Transit's so-called Blue Line light rail service to Cosumnes River College (CRC) in Sacramento. The staff report on the item notes the city's general plan calls for integration with all forms of mass transit, including light rail and bus rapid transit. With the extension of light rail closer to Elk Grove, the city is proposing changing the terminus of these route to light rail stations at CRC and Franklin Boulevard in Sacramento, rather than downtown Sacramento. The city is exploring the possibility of feeding riders for routes 52, 53, 57, 58, 59 and 60 to the two Blue Line stations. All these morning inbound and afternoon outbound routes conclude and originate in downtown Sacramento respectively. Another major change would be to route 156, which is the heaviest used local route. This route travels along Elk Grove Boulevard to Bruceville Road, and then on to CRC and the Meadowview Light Rail station with 30 minute frequencies during commute hours. The new route would eliminate the CRC stop and would terminate at the Meadowview Station. As a sweetener, frequency during commuter hours would be increased to every 15 minutes. Before any decision on route changes are made, the city will hold two public meetings during the 30-day comment period. Wednesday night's city council meeting starts at 6 p.m. If they terminate all commuter routes at Light Rail I think they're making a huge mistake. Ridership will suffer and our freeways will be filled with more vehicles. Light rail is too slow and with a transfer it will take forever. Based on the map Laguna West is completely left out. All those people who currently take the 52/53/66 will be driving on I-5. Sad. What is reason for the E-tran cuts? Is it money? Can't borrow any money from the drainage fund. That money went for the "Mayor Gary Davis's Soccer Stadium!" What's next for Elk Grove? How about a stadium for the Oakland Raiders to go with the major league soccer stadium? I know the city circulated a 'survey' in the last few weeks, but honestly, they will throw it in the trash and do what they want. The survey is just a PR 'formality'. Our city has long been notoriously unfriendly toward transit and those 'customers' who ride transit. You know, 'those' people, the voiceless, the low income. Commuter service has been considerably better, but then again, they are not the same ones who ride the city buses. Commuters are not the great unwashed, so to speak. Nevertheless, if commuters are forced to be diverted to CRC first, rather than going directly by bus into Sac, it will significantly increase their commutes. The commute routes as they are now are pretty quick and efficient, going directly into a variety of neighborhoods to and from Sac. To add a bus ride at the end of each light rail to take the person back to his/her neighborhood will significantly extend the length of the commute - up to double in some cases. Additionally, once light rail enters Sac, the distance between light rail stops is often quite lengthy, requiring much longer walks. Don't hold your breath. Elk Grove does not have the customer in its best interests. They will make up some BS, but that is all it will be. They will, however, try to accommodate the 'elites' who attend games at the arena. I have been riding e-Tran since it started. It has been a quick convenient way for me to get to work in the city. Now you want to take away that convenience? Really? Do you care at all about the public who is quite happy with how things are right now? Do you? It appears very clearly that you do not. I'm quite sure you have already made your decision on what will be done. The "public meetings" are just for show. We the public are not as ignorant as you seem to think we are. How about giving the commuters what they are telling you they need and leave things the way they are and not forget us and move on to where you will get more money. More money will come from raising taxes under the guise of fees. They can do this as the majority of residents suffer from apathy! The few who have attempted to voice majority views are disregarded by council and blasted on bloggs by most likely the development community. I sent an email to Jean Foletta, the city of Elk Grove’s transit manager for clarification if these changes were about the lack of money. I got no response. The entire Council has changed out and current staff were not employed by the city when the original Council voted to form our own bus service, so I restated what the citizens of this city were promised paraphrasing, "In forming our own bus service, the city promises now, and into the future, superior bus service than Regional Transit." Many a rider and active citizen spoke up at that time warning the Council that this was a bad decision; but alas, they were ignored. Over the years, we have seen major cuts to the E-tran bus service. Reason? Money! Is that the case here? I ask because of one sentence in Foletta’s staff report which states, ""Therefore, due to vehicle and fiscal constraints, no additional service can be recommended." Civics 101: We can never lose sight of the fundamental role of city government, though not glamorous, headline photo op making or applause getting, but critical to our city's residents’ daily quality of life, is service delivery. Maybe the chickens are coming home to roost! A city of our size has no business trying to run its own bus service (especially since we are not an employment hub). Too bad we didn't negotiate better with RT to have a truly regional bus system instead of trying to empire build. Of course, cutting back on bus service (along with diverting road maintenance funds) combine to help "sell" the new regional sales tax (and the extension of Measure A tax)for infrastructure, transportation, and trails. They can then offer to fund services they knowingly cut and make you think you're getting something new. When the bids come up, I think every five years, RT submits one, but the city rejects it and stays with the poorly-run MV. We could still have RT and connect smoothly with the rest of the region if the council would make smarter choices.